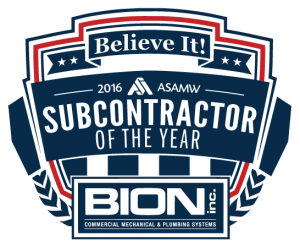 BION-Sponsored Apprenticeship Programs Offer Path to In Demand Careers – BION, inc.
Like many contracting firms, BION is impacted by a shortage in the labor force, which has been particularly hard on skilled trades. Associated General Contractors of America noted that 70 percent of construction companies are having trouble finding qualified workers. One of the ways that we seek to meet this challenge, and invest in the success of our employees, is through our sponsorship of the Department of Labor-certified Apprenticeship Program, offering four-year certification tracks in either Plumbing or Heating, Ventilation & Air Conditioning (HVAC). (Learn more about DOL-certified apprenticeships.) We have had some ambitious employees complete both! BION has sponsored its employees for this program since 2009. In addition to keeping students on the payroll and providing on-the-job experience, BION pays the majority of the school costs, which ranges from $900-$1,500/year. Additionally, we offer our several other training courses for current BION employees including our own welding classes, enabling them to advance in that field as well. Programs such as these offer an affordable and promising career path that can begin right after highschool. While the tendency is to promote college as the only way to be “successful,” there are some 30 million jobs in the U.S. that pay an average of $55,000 per year and don’t require Bachelor’s degrees, according to the Georgetown Center on Education and the Workforce. The bulk of these jobs come from the skilled labor that we rely on to build, pave, plumb, remodel and maintain our communities. For most of our apprentices, the program is just the start of their professional journey. After graduation, they may sit for the Journeyman test, and a year after successfully passing that, may test for their Master License (learn more). Internally, our former apprentices remain valued members of our professional team, with many promoted to foreman over time. BION students are also making a name for themselves while still in the program: Tyler, a third-year student, placed in a statewide Plumbing Apprenticeship Contest, earning himself a spot in the national competition at the Plumbing Heating Cooling Contractors Association conference. The contest required participants to rough-in a prebuilt half bathroom in under seven hours, with results judged on accuracy and precision. We are proud of Tyler and all of the dedicated professionals on “Team BION.” We give them the tools they need to succeed now and in the future, and they make the most of these opportunities. In addition to the success of our team members, we hope that programs such as ours inspire others to pursue careers as skilled labor technicians. Meet Nelson: BION’s First Welding Graduate!